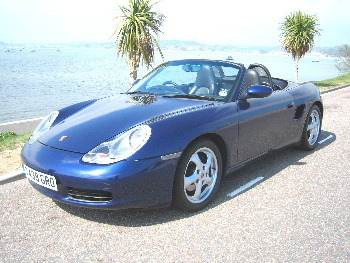 PORSCHE Boxster 2.5, 2 Doors, Manual, Roadster, Petrol, 1999 T Reg, 68,000 miles, Metallic Iris Blue. ABS, Adjustable seats, Adjustable steering column/wheel, Alloy wheels, Central locking, Driver airbag, Electric mirrors, Electric windows, Foglights, Electrically adjustable seats, Head restraints, Immobiliser, Passenger airbag, Power assisted steering, Rear headrests, Air conditioning, Anti theft system, CD Multichanger, Climate Control, Computer, Cruise control, Headlight washers, Heated screen, Heated seats, Leather upholstery, Remote locking, Radio/CD Multichanger, Tinted glass. 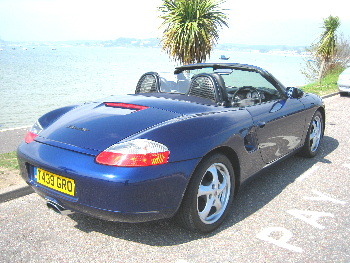 Hard & soft tops,Tracker,GPS Prep,Wind Deflector,Xenon lights,Clear lenses,Full Lux pack,Powerhood,Full Porsche Service History,last Major service at 64,000,Taxed and MOT'd,My own car ,Superb throughout.